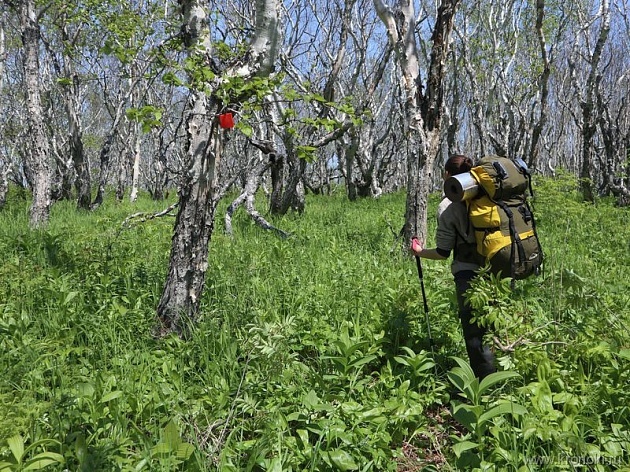 Specialists of the Kronotz Reserve develop a cognitive walking tour “To the Land of Volcanoes and Geysers.” The other day the volunteers cleared part of the trail leading from the Semyachik Estuary to the valley of the Geysernaya River and checked the route. “Participants of the hike – experienced tourists and instructors – tried to choose the most convenient and shortest path with minimal load on the ecosystem. It is planned that the carrying capacity of the route will not be more than 300 people per season, “said Rinat Fayzulin, head of the cognitive tourism department of the Kronotsky State Reserve FGBU. Volunteers, accompanied by security officers of the Kronotsky Reserve, had to overcome about 70 km. However, in the upper reaches of the Korotko stream, about 15 km from the Valley of Geysers, it was necessary to turn around – further the path is lost under snow. “Winter this year was very snowy, probably the snow cover in the mountains will not come before August. Nevertheless, I think our trip is successful – we cleared the path from the fallen trees and dry bushes, repaired the bridges over the stream at the Semyachik hot springs. The Volunteers did a lot of work on the site of the balnearies operating in the Soviet times on thermal springs – they collected scrap metal. All garbage we put in the economic building for the subsequent export from the territory, “said the senior state inspector of the Kronotsky State Reserve FGBU Nikolai Solovyov. The Subbotnik on the Semyachik hot springs was timed to coincide with the All-Russian action “Green Route”. Its goal is to popularize ecological tourism and healthy lifestyles, promote the idea of ​​nature protection and attract volunteers to the trails and tourist infrastructure. We add that walking one-day and multi-day hikes is one of the priority directions of the development of cognitive tourism of the Kronotsky Reserve. New routes have already been developed for the Central part of the biosphere reserve – travelers can measure by their steps kilometers of wildlife from the Kronotsky Tundra to Kronotsky Lake or the Pacific coast.